This was a given to me as a gift and I’m so pleased that it was as I’ve never read anything by Alison Bruce before and I’m always over the moon when I find a new author whose work I enjoy reading. Now I need to find myself a copy of Siren! The main character, DC Goodhew, has a brilliant mind which he has to try to restrain in order to keep within the rules; and the law! He is an engaging character, with many quirks and eccentricities as befits the role. I really warmed to him and look forward to seeing how he develops in future books. I loved the descriptive walks through Cambridgeshire, it has made the town really come alive for me and I will enjoy looking out for some of the places mentioned in the book. I thought it was well written, had clever twists and turns with lots of loose ends to unravel and I thoroughly enjoyed reading it. Like all my reviews, I don’t want to spoil the story for you so I’ll let you find that out for yourself when you read the book! 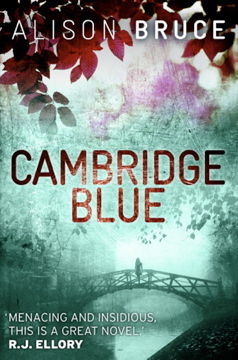 Synopsis: Gary Goodhew is intelligent, intuitive, and the youngest detective at Cambridge’s Parkside Station. When Gary discovers the first body in a series of murders involving an eccentric Cambridge family, he gets his chance to work on a homicide investigation. He must use his own initiative to flush out the killer, even though it means risking his job and discovering the truth about the one person he hopes is innocent.